I always find buying birthday presents hard, especially for friends who generally have everything they need and/or are renting/living in a small apartment so they are trying not to hoard too much stuff. So edible/drinkable presents are the way to go, they are even better if you make them yourself. Growing up in a non-English speaking family, my first exposure to English was through watching TV, so I learnt to speak English from shows like Play School and Sesame Street. I have many memories of trying to imitate the Cookie Monster and shouting “Me want cookie! ", "Me eat cookie! ", and "Om nom nom nom" when I was young. I think cookies make good gifts, everyone loves cookies right? I recently baked cookies as a birthday present for my friend Adam. To put things into perspective, last year it was Adam’s 30th and a group of us chipped in to buy him a Fender guitar. How do you top that? Thankfully, 31 is not one of those special birthdays, so there was no pressure surrounding present giving this time. But being a food blogger, people expect more from you, so there is always a little bit of pressure to cook amazing things all the time. So I knew that if I was going to bake cookies for a birthday present, it wouldn't be an ordinary cookie, it would be an ultimate cookie. The cookie would contain the best things in life, so I settled on peanut butter and chocolate, it’s a winning combination. But that wasn’t enough, I had to up the ante, so I incorporated some caramel in the form of Dulce de Leche. I could not think of anything else to add to this cookie to make it better. This was it. This would be the ultimate cookie. When I made the Dulce de Leche, I wasn’t sure how I was going to incorporate it into the cookie. There was a number of possibilities – using it as a spread to sandwich the cookies together, mix it into the cookie dough along with the peanut butter or drizzle some on top. In the end I decided to stuff the cookie dough with Dulce de Leche. In my head, I had visions of biting into the cookie and the Dulce de Leche would ooze out. The baked cookie didn’t have the effect I was hoping for, instead the Dulce de Leche melts into the cookie so the middle isn't really gooey but is incredibly soft and moist. I like the composition of this cookie and how every bite gives you a different experience. First bite gives you a nice salty peanut buttery hit, the choc chips are scattered throughout so you score a choc chip with some bites but not all, midway through you get the combination of peanut butter and Dulche de Leche and if you are lucky, you may hit the trifecta of peanut butter, dark chocolate and caramel in one bite! A popular way of making Dulce de Leche is to put a can of sweetened condensed milk in a pot of boiling water and simmer for a few hours. This boiling a can method doesn’t sit well with me, surely something will go wrong like the can will explode or something?! But I came across a method for Dulce de Leche from David Lebovitz which takes less time and appears to be fail proof. To make Dulce de Leche, preheat the oven to 220° C. Pour one can of sweetened condensed milk into a glass pie plate or shallow baking dish (I used my lunchbox sized glass Pyrex container). Stir in a few flecks of sea salt (I actually forgot to do this at the beginning so I stirred in some salt at the end instead). Set the container within a larger pan (I used an 8X8inch baking pan) and add hot water until it reaches halfway up the side of the pie plate. Cover the pan snugly with aluminum foil and bake for 1 to 1¼ hours. (Check a few times during baking and add more water to the roasting pan as necessary, I checked it and added more water only once at the 45 minute mark). Store in the refrigerator until ready to serve. Warm gently in a warm water bath or microwave oven before using. Preheat the oven to 180C and line two baking sheets with greaseproof paper. Beat the butter, brown and caster sugar until smooth. Beat in the egg and vanilla until well blended (remember to scrape down the sides of the bowl while beating). Then beat in the peanut butter. In a separate bowl, whisk or sift together the flour, baking soda, and salt. Gradually add the dry ingredients to the peanut butter mixture and stir with spatula until combined. Then add in the chocolate chips and mix thoroughly into the dough. To make the ultimate cookie. Scoop up a heaped tablespoon of the dough into the palm of your hand and flatten a bit. Add a teaspoon of Dulce de Leche into the middle, fold the edges of the dough over to encase. Gently roll the dough between your hands to smooth and form a ball and then flatten. If the dough is too soft to form balls, can chill in the fridge for 30-60 minutes to firm up. Place each cookie dough on the baking sheets about 2-3 cms apart. Bake the cookies for about 15 minutes, rotating the baking sheets midway during cooking, until they are light-golden brown and the edges start to darken. Remove from oven and leave the cookies on the baking tray for 10 minutes before removing to cool completely. The cookies will appear quite soft when they come out of the oven but will continue to cook and harden with the residual heat from the baking trays. I've seen a lot of blog posts on ANZAC biscuits over the past few days but who doesn't like eating ANZAC biscuits? I love the mixture of oats and coconut, and its chewy biscuit texture. Plus, there is the whole war significance of these biscuits, where they were originally called soldiers’ biscuits and were made by women (wives/mothers) on the home front and sent overseas to the fighting soldiers in the trenches. Not that I think that war is a good thing but I love watching war movies. There is something in the way that humanity is portrayed in all its moral complexities and brutality that makes it really engaging and thought provoking – the good versus bad dilemmas, the civilian experience, the bonding/comradeship of soldiers, the combat scenes that leave you clutching your seat in anticipation because you don’t know who will come out of the battle alive, the journey and growth of the characters in movie - war can bring out the worst and best in people, and I cannot help but be fascinated by it and all its absurdities. Maybe some of this fascination stems from the fact that my parents lived through the Vietnam war. They would often tell us kids stories of how they had curfews and couldn’t go out at night, that it was hard to sleep as they could hear bombs flying overhead all the time and of course food was scarce, and we would always be reminded of this whenever we complained about the food that we were eating. It’s hard for me to even phantom what it would have been like for my parents during the Vietnam war but war movies give me some frame of reference. An interesting thing that I found out about ANZAC biscuits is that the word ANZAC is protected under Australian law, and should not be used without permission from the Minister for Veterans' Affairs. However, there is an exemption granted for ANZAC biscuits, as long as these biscuits remain basically true to the original recipe and are both referred to and sold as ANZAC biscuits and never as cookies (apparently the word ‘cookies’ has non-Australian overtones). So the recipe for ANZAC biscuits is pretty standard and not to be messed with. I’ve come across recipes that try to be ‘different’ and add nuts or chocolate, but these variations would not be considered real Anzac biscuits. I’ve even seen ANZAC biscuits referred to as cookies! Call the General! I stayed close to the original recipe, only altering the mix of sugar (used both caster and brown sugar for a chewier texture) and adding in a tablespoon more of golden syrup. I have also elaborated on the method. The recipe I adapted was from the Australian War Memorial website http://www.awm.gov.au/encyclopedia/anzac/biscuit/recipe.asp which is recognised as an official version. Preheat the oven to 160C. Line baking trays with greaseproof paper. In a large bowl, thoroughly mix together oats, coconut, flour and sugars. Put the butter and golden syrup into a small saucepan over low heat, stirring until the butter has melted. Remove pan from the heat. In a small bowl, dissolve the baking soda in very hot water. Pour this into the melted butter/golden syrup. Make a well in the dry ingredients and pour in the butter/golden syrup/baking soda mixture. Stir together until thoroughly combined (should have a moist but firm consistency). Bake for around 10 minutes until golden brown but still soft. Remove from the oven and let the biscuits sit on the trays for a few minutes before removing them. Last year at the Revelation Film Festival I saw the documentary Sound it Out which was about the very last surviving record shop in Teesside, North East England. It showed the meaning of shop to their customers and the role music plays in people’s lives. This documentary made me feel very nostalgic, I could really relate to it. I have been a huge record nerd for a large part of my life (disclaimer: when I say records I mean the CD version, I don’t have a vinyl player). I used to spend hours after uni and on weekends hanging out at independent record stores in the city. I loved browsing the shelves, seeking new music and listening to artists on the listening stations before deciding to buy. I became one of those regular customers where the dudes behind the counter would recommend me CDs and save CDs for me to listen to when I came in. I have discovered so many great bands through my experiences in record stores. It’s strange to think that nowadays people grow up without this experience and are just downloading music online instead. On Saturday 21 April 2012 it’s Record Store Day, and I encourage everyone to go out and support their local independent record store. Is there any point in buying a CD nowadays when you can just go online and download anything you want, and play in on a portable media player? I like the experience of shifting through my CD collection and picking up individual CDs, opening them up and deciding whether or not I want to listen to it. Each CD also comes with a memory, where I can usually remember at what point of my life I bought it, some have stories of battle wounds I have suffered to get it (ie: the hunt high and low at various record stores to collect the back catalogue of bands and waking up at insane hours in the morning to bid for rare CDs on eBay), the wear and tear on the case and scratches on the CD reveal how much I have listened to it and where I have taken it. I have a connection to my CDs that I wouldn’t have if they were all just a bunch of files on my computer. But then again, I am of the generation where people started their music journey buying cassette tapes and then CDs, so buying CDs at record stores has formed a major part of my experience and appreciation of music. I used to get excited when I received a postcard from 78 Records informing me that a CD I had ordered had come in and was ready for pick up. When an album was released, I’d make the journey to the record store to buy it. A digital download doesn’t compare to the feeling that you get when you have a physical copy of the album in your hand, to see all the artwork and unfold the booklet to read the liner notes. I feel like it’s the same thing with cookbooks. Cookbook sales are declining, many are loving the ease and convenience of downloading books/recipes on their iPad but to me it’s not the same as having a physical cookbook which you can flick through and read for ideas and inspiration, flag recipes to try and find your favourite recipes with the pages stuck together with food stains. Here is a list of the independent records stores in Perth and Fremantle to check out on Record Store Day, and if you continue reading, you can read about the 10 albums that have changed my life. 78s was the record store that I used to frequent the most, almost weekly throughout my uni days. The staff were always good to me and have recommended a lot of great bands. 78s was a huge space back in the day and there was an upstairs part as well where bands would play live. Now it has being downsized, the collection isn’t as extensive but there’s still a reasonable range and a good place to order in CDS that you can’t find anywhere else. DaDas is like a treasure trove, it’s the kind of store you could spend hours in, digging through their collection which is overflowing on the shelves. It has an extensive range of vinyl and CDs, where you can find stuff from lesser known, more obscure acts. It always amazes me how they keep track of everything as they don’t have a computerized system, there are towers of CDs everywhere behind the counter and when you make a purchase, your sale is scribbled down on a notepad. From time to time, Dadas holds gigs in its garage behind the store. A new kid on the block which has only been open for about a year, located in a basement, mainly selling vinyl with a section of CDs dedicated to local artists. Fat Shan is a great supporter of local music and regularly hosts gigs, and provides a jamming and recording space for bands. They also have a section of vintage out the back. This store is the prettiest, it feels like you are down into someone’s lounge room, it has a really comfortable and intimate vibe, and lots of fairy lights. Another newish record store that has been opened a little over a year on the refurbished William Street precinct, sandwiched between independent retailers and vintage stores, Noise Pollution Records sells a great selection of secondhand and new vinyl, and specialises in collectible, import and hard to find LPs. It’s a small store but there is a lot packed in. I like how the place is decked out with memorabilia and posters on the walls, it feels like you have walked into some record collector’s bedroom. There is also a little sub-store called Strummers Guitars out the back which sells a range of second-hand guitars, as well pedals and provides guitar repairs. 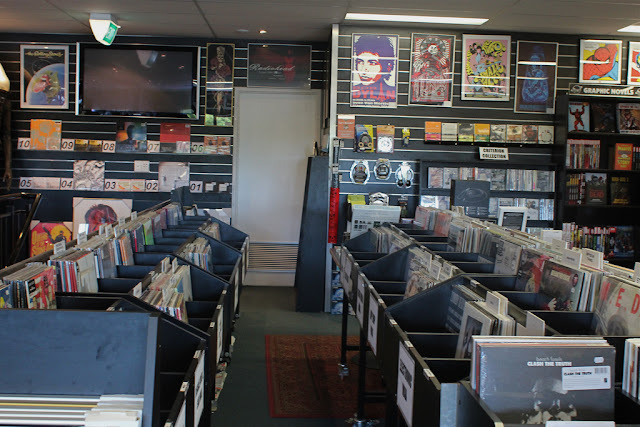 A cool little record store out in the inner city suburb of Maylands with a lot of quality second hand stuff so there is a range of interesting and diverse vinyl and CDs to shift through. You are more likely to find older stuff here than newer stuff, and the pricing for a lot of the items is also at the lower end of the scale so you will be sure to get a bargain. Fremantle is a bit of a trek for me but this is the record store I check out if I’m ever in Fremantle. 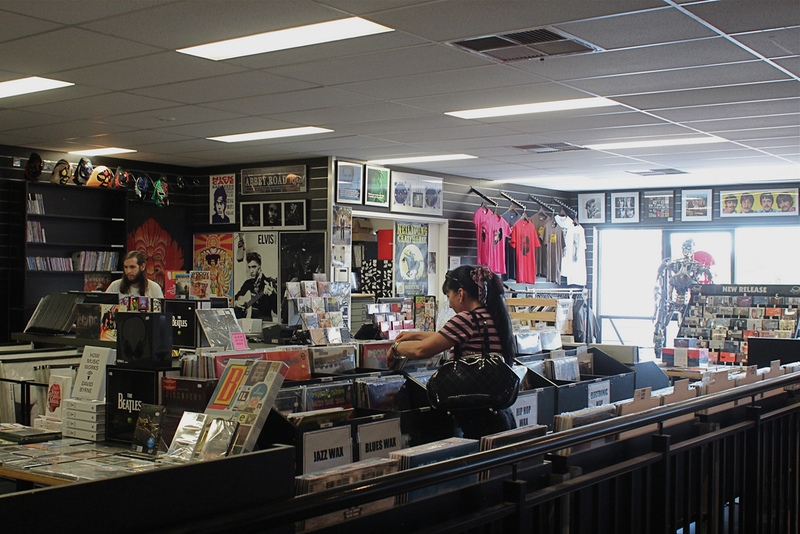 Downstairs at Mills Records you’ll find CD and DVDs, and upstairs you’ll find tshirts and vinyl. Hidden away from the main streets of Fremantle and situated in the intersection of two arcades, Junction Records is the rebranded CD Library where you can trade in your CDs and find a great range of new and second hand CDs. You can also get a membership to the store to get further discounts on items. This store has an old school feel to it, like someone’s dusty old basement with a secret stash of records. The Record Finder is packed wall to wall with all sorts of paraphernalia, books, vinyl, CDs and cassettes! Just in case you still drive a car from the 80s and only have a tape deck. A lot of the stuff is pre-1990 too so it’s a place to go to if you are after an old hard to find record. Planet Video is a Perth institution, a place that stocks every movie you could image, with sections like cult and festival, it’s not your average video store. The Planet Video that I grew up frequenting religiously on a Friday night was on the corner of Walcott and Beaufort Street, but it has moved a few doors down and redeveloped into a little empire with movie rentals as well as a bookshop, café and record store. The record store is located upstairs. 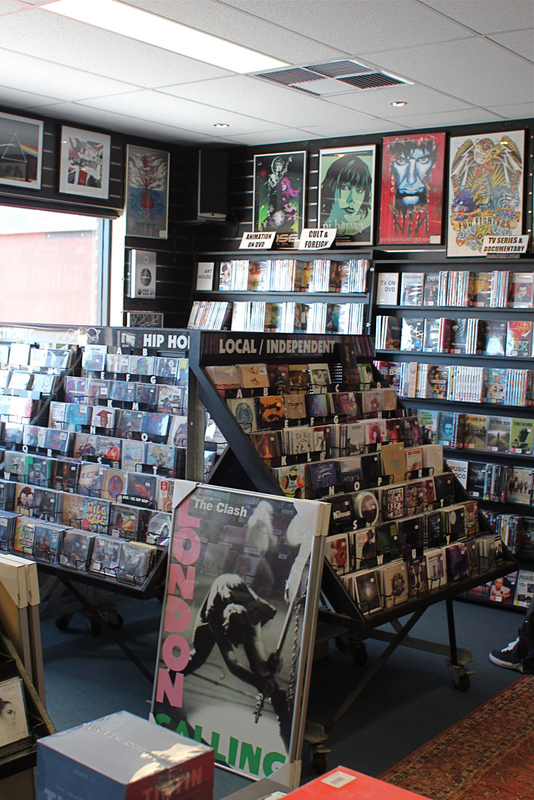 Planet Music offers an eclectic mix of CDs, vinyl, t-shirts, posters and books. With Planet Video, Planet Music, Planet Books and Daily Planet all interconnected, you can pretty much loose yourself there. Another new little record store in Perth located out the back of Beans and Bunches florist in an arcade on William Street. I almost missed it the first time I tried to find it. Look carefully around the florist and you’ll see a hallway, and the sounds of groovy tunes will lure you in. The record collection is more psychedelic, funk, soul and jazz, and you’ll also find some classics. The store is decked out in a way that makes you feel like you are entering into some tropical paradise. I like the vibe of this place and the collection is small enough so that you can flick through it all. Growing up I always dreamt of working at a record store one day and I got my chance in 2004 when I saw a job advertised on Seek for Funky Beats, a little CD stall at the Malaga Markets. I was hired after my overenthusiastic interview performance and worked there between 2004-2005 on the weekends until the owner sold it. Funky Beats specialized in selling second hand CDs which the owner would source and I would spend my shifts cleaning up the scratches with a special machine and putting the CDs into new cases. There was a small selection of new CDs, mainly those that were on the charts, and a lot of R&B and hip hop. As it was at the Malaga Markets, the clientele were mainly families that were doing their fruit and vegetable shopping on the weekend. It had it’s moments though, like when a guy would came into the stall and buy a second hand Metallica CD for himself and the new Avril Lavigne CD single for his daughter while his wife was doing the food shopping. At Funky Beats I found a whole pile of CDs the owner was selling in the $2 bin, they were all these alternative, not very well known bands. The owner had acquired all the leftover stock from Subterranean Records (which used to be where Fat Shan Records is now) when they closed down. It was a bit of a goldmine but the owner didn’t realize it and no one else who came into the Malaga Markets would ever appreciate any of it. But I knew what to do with it, I started listing everything on eBay during my shifts and a CD which was in the $2 bin would sell for at least $10 online and up to $30, and sometimes even more. It was fun going through the CDs, researching and identifying the ones that were worth listing on eBay and writing a description that would interest people. So my music nerdism became a valuable job qualification, who else would have understood the value of eBay for music obsessives? The owner was quite impressed with my ability to significantly increase profits at the stall via eBay. Music was my first major passion in life but nowadays food and blogging has taken over. I’m much less active in discovering music the way that I used to during high school and uni, instead I spend a lot of my spare time learning to cook new things, reading cookbooks and blogs. As with music, I feel that cooking allows me to be creative and express myself. I still buy CDs but not as much as I used to, and I still go out to see gigs but not as often. I had a pretty strict Asian upbringing, I rarely went out and had curfews when I did. My parents were very education oriented so I was a major study nerd, quiet and shy. I think this kind of life would not be unfamiliar with a lot of Asians growing up in Australia. But somewhere along the way I found my refuge in music, it was escapism. Growing up with parents from a non-English speaking background (well mum can’t speak English and my dad speaks English but sometimes he gets his words mixed up, like the time he wrote a note for my brother to take the rubbish out and he wrote rabbit instead of rubbish), I wasn’t exposed to music until I was a teenager, unlike friends that I would meet later on in life, I couldn’t say that I grew up with my dad’s cool record collection. I got a walkman for Christmas when I was in year 7 and I mostly listened to the commercial radio stations, it wasn’t until I discovered alternative music in year 9 that my life changed. Music has really defined me as a person, it’s contributed to my self discovery and played a major part in shaping my life and the person that I am today. So here I share 10 albums that have changed my life. Veruca Salt was the beginning of everything. Their second album Eight Arms to Hold You was the first alternative rock album that I bought. Before Veruca Salt, I was just listening to the usual top 40 pop charts, mainly a lot of R&B…then one day on Rage I saw the video clip for the song ‘Volcano Girls’ and I thought that it was the coolest thing ever – girls rocking out with guitars, jumping up and down, and going nuts. I wanted to be just like them. So pretty much from that moment onwards, I started getting into alternative rock music, switching over from the commercial radio stations to Triple J.
I was in year 9 at this point of time, I was one of those super studious shy Asian types and I had a horrible haircut that only an Asian mother can give (sorry mum, but the best decision that I ever made was to save enough pocket money to get a real haircut). I wrote in big letters VERUCA SALT ROCKS! in a black marker across my pencil case (as you do when you are a teenager). One day, one of the bogans in my class pointed at my pencil case and asked me if I liked Veruca Salt. So why did this matter to him? Because the album Eight Arms to Hold You by Veruca Salt was produced by Bob Rock who produced Metallica’s Black album. This was Metallica’s breakthrough album in that it brought them to the attention of the mainstream and also their most well-known hit ‘Enter Sandman’ as well as other songs like ‘The Unforgiven’, ‘Nothing Else Matters’. So I became a super nerdy Asian girl who had just a little bit of rock credibility. When I was about 18 and had saved enough money I bought a red SG, a guitar just like the one used by Veruca Salt, except that it was the cheaper Epiphone version and not a Gibson. I guess anyone who starts playing guitar would have some sort of dream of playing in a band one day but I seriously never thought that it would become a reality. 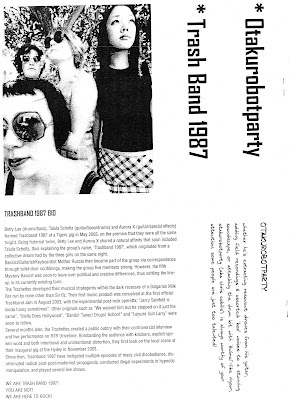 However, when I was 20 and going to gigs a lot, often on my own, I befriended some girls who had similar music tastes (specifically a local Perth band called The Tigers) and we become Trash Band 1987, inflicting incoherent noise on the Perth music scene from 2003-2006 (you can read more about Trash Band here). A sign that we made it! TB87 sticker on the 78 Records catalogue computer. Photo taken on 30 March 2012 and yes the computer still works. PJ Harvey was the first female artist that I really admired. As a female, I generally prefer female singing voices and I have a lot of female artists in my CD collection. I could relate to them more, I could try to play guitar like them more and I could try to sing along to them more. They were also an inspiration to me, my role models in life. I wish I could rock out more, be more extroverted and out-spoken than my then introverted Asian self. PJ Harvey says that her lyrics are not autobiographical, that they span a wide range of subjects and explores all manners of being human. The way I see lyrics is that no matter what the artist’s intention is, every listener draws from it their own interpretation and connections to the song with their own context. PJ Harvey’s music and lyrics have always struck a chord with me. The first album of any artist that you buy always has a special place in your heart because it’s the album that got you into them and there’s a sentimental value to it, especially in the formative years of discovering music. Rid of Me was the first PJ Harvey album that I owned. I thought her voice was amazing. I loved the rawness of this album, the themes it explored of desire, break up, fury, fearlessness and loneliness, and the explicitness of her lyrics...”lick my legs I’m on fire”… When I got this album, I had it constantly on repeat. I saw PJ Harvey play at the Perth Concert Hall in 2008 and I was the girl that sneezed! PJ Harvey was touring for her White Chalk album and it was a stripped down affair, on stage she was often just playing on her own, alternating between guitar and piano. Sometimes calling out to her bandmates to come on stage to join her for a full rock number. That night, it was quite cold in the concert hall and during a really quiet moment (like one of those when you could almost hear a pin drop) and PJ was slowly starting out a tune on the piano, I sneezed and it echoed throughout the hall. It made PJ stop and giggle a little, ironically during the moment that I sneezed she was starting the song 'The Mountain' (I think) and being high above a mountain would be quite cold and chilly, and the music to the song sounds like wind chimes. So how funny (or fitting) is it that someone would sneeze during that exact moment. Well PJ thought it was very funny, she tried to restart the song but couldn’t keep it together. She said sorry and went back stage to drag out her band for a more rocking number, and then later on would she go back to the piano and finish off the song she was meant to play before I interrupted with my sneezing. So one of the best moments of my life was when I sneezed at a PJ Harvey concert! Was anyone at this particular concert and do you remember this unexpected incident? I went through a period of being really into Something For Kate. I loved the songwriting which reflected a lot of emotions I was going through during the time I was listening to them. Beautiful Sharks is my favourite Something For Kate album, but if you were a real fan of Something For Kate then you would know that they are all about their b-sides. They are a band where fans would bid ridiculous amounts for their CD singles on eBay just to get the b-sides because the b-sides would be better than any album tracks. Through a Something For Kate message forum I had my first official internet meet up with a guy who bootlegged Something For Kate shows back in 2001 or 2002. We became good friends and I have acquired a pretty significant collection of Something For Kate bootlegs of live shows between 1997 and 2002. Through this guy I also got into the local Perth music scene, he’d always get me out to local gigs, for a very specific group of bands which included Adam Said Galore, The Tigers, Mukaizake, Tucker Bs (all the great indie bands of Perth, well in my opinion). Adam Said Galore was the first local Perth band that I really got into when I started going to local music gigs. My friend once told me that Adam Said Galore are like a magic eye book, if you can focus on the patterns, you will eventually see the picture and its beauty, but if you don’t, then all you see is a random image of patterns. Adam Said Galore don’t have conventional song structures and play the kind of music that you get lost in, it slowly builds up with meandering guitars, there are soaring and intense numbers, and some sweet melodies. I made an effort to see Adam Said Galore every time they played live and have discovered many other amazing local bands. The Perth music scene is one of the reasons why I love living in Perth. There was a documentary made in 2009 called ‘Something in the Water’ which explored how Perth ‘the most isolated city in the world’ has produced a prolific, successful and internationally renowned original music scene. Through the Perth local music scene I have also met my friends. Everyone has a close group of friends that they keep of people who they have probably known since high school, studied with at uni or worked with (and these days probably met off the internet too). My close group of friends comprises of people that I have met through the Perth music scene and they are an amazing bunch of people. I cannot imagine who my friends would be without music. The very first Sonic Youth song I ever heard was ‘Drunken Butterfly’ off their album Dirty. I remember catching the bus back in high school and my friend showed me this song that she had been listening to on repeat on her CD player. At that time ‘Drunken Butterfly’ was unlike anything that I had heard, it was an intensely noisy song with fuzzy swirling guitars, lots of feedback and edgy vocals, and I found it infectious. I loved the song so much that I bought my own copy of Dirty soon after, and then I would go on to collect their back catalogue and buy every Sonic Youth release when it came out. Sonic Youth gave me an appreciation for noise, distortion and garage rock. 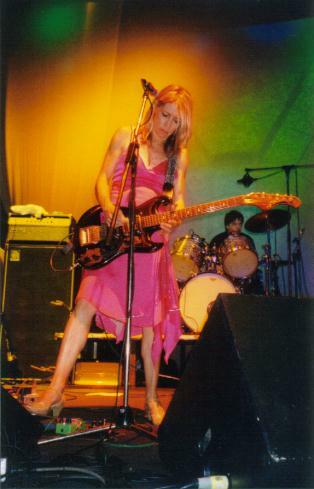 I saw Sonic Youth for the first time in 2004 when they played at Metropolis Fremantle. I made my friend get down early and we were lining up at the door at 7pm even though doors opened at 8pm and no one else was there yet. It was worth getting down early as we were front row and experienced one of the greatest moments of my life. During the song 'Kool Thing', Kim Gordon was just rocking around the stage with the mic and during the chorus she would sing “I don’t wanna” and then point the mic to the crowd for us to sing “I don’t think so”. Who do you think was right in front of the mic in the crowd and jumping up, grabbing the mic and screaming the lyrics the loudest? Me! This is a photo that I took of that gig, I was so close and how amazing does Kim look at 50 and still rocking out in a hot pink dress and heels. The first time that I heard of Slint was during a Triple J, J File on silverchair. Daniel Johns was asked to play his top five albums and one of them was Spiderland by Slint. He introduced the song ‘Washer’ as a song that “will touch you in ways you have never been touched before”. I listened to this song and was completely mesmerized by it. It was/still is one of the most beautifully songs I have ever heard in my life. Slint were significant in changing my direction in music, they opened me up to a whole new world of music, they made me want more from what I had been listening to. From Slint onwards, I moved away from all those Triple J, I guess more mainstream alternative bands and I started going indie, I went underground and I got all math rock. Math rock is characterised by rhythmically complex guitar sounds which is viewed as ‘mathy’ because it uses a wide variation of time signatures which are constantly changing as opposed to the standard 4/4. Math rock sounds like calculated chaos at times and can also have a jazzy feel to it. There is an intricacy to the music that I find very compelling and explosive for my ears, there's always a unique melody or hook that keeps repeating in my head. Do you want to listen to some Math Rock? I recommend these as a starter. I loved Slint so much that I wanted more, so I researched Slint related artists and built up a family tree of bands which have stemmed from members of Slint or were similar to Slint like The For Carnation, June of 44, Rodan, Shipping News, Rachel’s, Tortoise, Polvo, Rodan, Sonora Pine, Don Caballero, Karate, Dianogah, Aerial M/Papa M. You could describe me as being pretty obsessed with collecting records from the Slint family tree but it was rewarding as I got into some really amazing bands. Another significant link on the Slint family tree is that Steve Albini has recorded quite a few of the albums and also many albums of other bands that I own. Imagine my delight when I find out that ‘the’ Steve Albini has a food blog! That man can play music, record, cook and write…man can he write, he's posts are always interesting and engaging. Steve Albini’s food blog is a blog worth reading, check it out http://mariobatalivoice.blogspot.com.au/. On the question of music versus lyrics and what’s more important, I used to think that music needed to have lyrics in order for it to mean anything. Godspeed You! Black Emperor was the band that made me really appreciate instrumental music. This album is often described as ‘a sad and beautiful soundtrack to urban decay’ and I could hear what they were trying to portray and express through their music even though there were no lyrics to accompany it. There are little monologues in between the songs which give it a cinematic quality, but the songs stand on their own. GY!BE led me to become a big fan of instrumental music, especially post-rock and I often prefer songs without singing. Post-rock bands play instrumental songs that are usually lengthy and create soundscapes that evolve to a crescendo or climax. Similar to my experience with Slint, I sought out the GY!BE family tree and collected albums from A Silver Mt Zion, Do Make Say Think , Fly Pan Am, Set Fire to Flames and Esmerine, and also got into a lot of other post-rock bands like Explosions in the Sky, Grails, Mono and Mogwai. 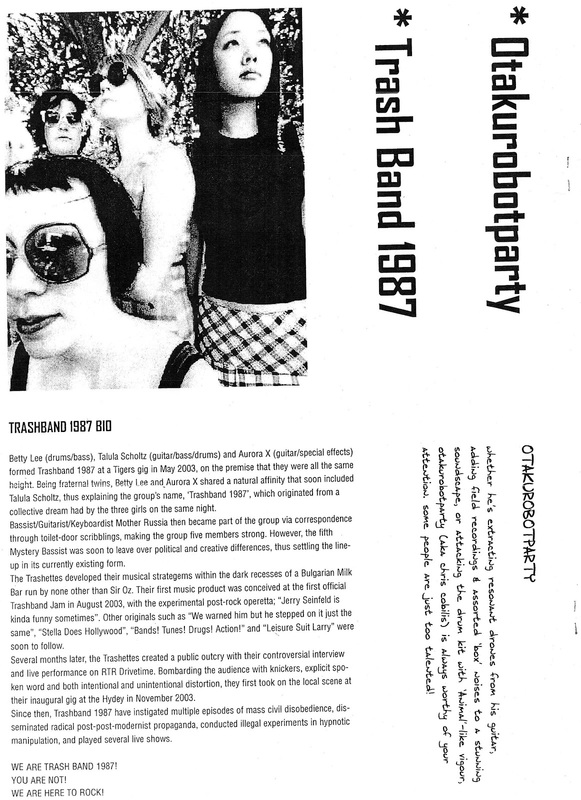 Back in the day I joined the YahooGroups for GY!BE and a fan in Greece sent out a message to the group in 2003 about putting together a fanzine dedicated to GY!BE and asking for suggestions on what to include. (I managed to find the original text message http://dir.groups.yahoo.com/group/gybe/message/9609!) I didn’t contribute but I asked for a copy as I was a huge GY!BE fan and at no cost to me, I was posted a copy of the zine in 2004, all the way from Greece. I can’t read or understand any of it as it’s in Greek but I love the fact that strangers can share with you their love for a band. Can anyone read Greek and translate the pages of the GY!BE zine for me? Music is therapeutic. I love how when you listen to music it has the ability to help you get through stressful situations and lift your spirits. I listen to a lot of songs that relate to my mood and it’s comforting when an artist can express how you feel, it feels like a release. Listening to music can help to control emotions and can be a way of coping with difficult situations. I’m a huge Radiohead fan and they are a band that I listen to therapeutically. They have released so many great albums that it’s hard to choose a favourite but I’ll say that The Bends has a special place in my heart, for all those times that I listened to that one song wishing that I could be bulletproof too and singing at the top of my lungs breaking into a bad falsetto “don’t leave me highhhhhh, don’t leave me dryyyy”. If I made a list of things I would like to be able to do before they die, seeing Radiohead would be on that list. A measure of how much one likes a band is the length that one goes to see them. The last time that Radiohead toured Australia in 2004 I missed them, so I am very excited that I will see them for the first time this year in November in Sydney, especially considering the ordeal that I went through to get tickets. Presale 12noon (EST) Tuesday 28 February, I’m at my desk at work at 9am frantically trying to buy Radiohead tickets. There was only a small release of tickets that everyone was trying to get their hands on and the system was crashing all the time. I was very frustrated at being asked over and over again to enter in certain details and tick boxes which I had already done. My manager walks in and starts talking to me and I say to her “Sorry, but I can’t talk to you right now, I’m trying to buy Radiohead tickets”…Thankfully my manager was very cool about it all, a lot of my friends told me that their manager wouldn’t stand for that kind of behaviour but my manager was very understanding. I missed out on presale tickets so I had to get a ticket when they went on sale to the general public at 9am (EST) Thursday 1 March which would be 6am Perth time. But I have a problem in that I don’t have the internet at home so I had to get 24 hour access to the building so that I could come into work early on the Thursday morning that tickets went on sale. I asked my manager if she could organize 24 hour access for me and I didn’t even try to make up some lame excuse, I just told her exactly why I needed it – “I’m trying to buy Radiohead tickets”. My manager approved my request and then contacted the necessary people to get it sorted out, and I’m very grateful for it. Now I am in possession of a Radiohead ticket for the 12 November show, after waking up at around 5am so that I could get into work, 6 attempts with two computer screens running, my iPhone processing and a long wait on hold as I tried to call BOCS, I finally got a ticket (via computer route). My seat is quite far back but considering the number of people I know that missed out I feel quite lucky! I don’t mind jazz, I respect jazz, but I don’t think I ever found myself loving jazz and the way it moves you, until I heard this album. This is one of my most listened to albums. I can listen to this album for hours on end, that’s how good it is. The first time I heard the song ‘Freakmachine’ on RTRFM from this album, I was blown away, it has so many great moments – when the trumpets kick in, when the sax breaks into it’s solo and then another solo, and I love the way the instruments play off each other. It’s a song that will undoubtedly get me swaying and tapping my feet. Listen to Freakmachine and feel the jazz inside you come alive! This album led me to spend a lot of time exploring more contemporary and experimental jazz artists like Cinematic Orchestra, Bohren & Der Club of Gore, Jaga Jazzist, The Necks, and Triosk. Nothing beats this album though! Of course my list of albums that changed my life would not be complete without Tool. As a teenager I thought that Tool was the MOST amazing band ever, they were "the thinking person's metal band”. I was fascinated by Tool. I thought that their music was really different and progressive, I loved their artwork and video clips, and their lyrics were really philosophical. I would spend hours on the internet on Tool websites and music forums trying to understand Tool more and learn about the meaning behind their songs. I learnt that one of the unifying forces behind Tool was the philosophy/religion known as Lachrymology, which translates literally to "the study of crying." The basic tenet, evident in the band's music, is that the greatest road to advancement is through pain - emotional and physical, specifically its release through crying. The drummer Danny Carey once explained that "We wanted the band to be a 'TOOL' to learn and gain from. The idea is not to inflict pain on yourself, but to learn and grow from the pain that has been inflicted upon you”. When I was a teen, I truly believed that Lachrymology was a real thing but later on I would find out that it was all made up, some believed that it was to further fuel the Tool mystique and others saw it as a parody on religious cults. Regardless of this fact, the principles of Lachrymology resonated with me and as a teen who was feeling a bit lost and confused, the music of Tool got me through things. Back then I even dressed like a Tool, well I would regularly wear Tool shirts, black skirts and boots (I may have been going through a semi-bogan goth stage, don’t we all?!!). My food blog is named after the Tool song 'Eon Blue Apocalypse'. I dyed my hair blue in year 11 and kept it blue into the first few years of uni and used Blue Apocalypse as an internet alias for internet interactions MSN, emails, ICQ etc. When I decided to start a food blog and was a bit stuck on a name I choose Food Endeavours of the Blue Apocalypse as I already had a flickr account with the username Blue Apocalypse which I regularly posted photos of my cooking. In hindsight, I probably should have chosen a blog name that is more food related, when people ask me what the name of my food blog is and I say “Blue Apocalypse” it is generally met with looks of confusion. I’ve even had people suggest to me that I change the name of my blog so that I would be more recognizable as a food blogger. But I like the name of my blog, it represents who I am. I still really enjoy listening to Tool and while I have quite diverse music tastes, my metal streak has never left me. I have an affinity for metal but these days I’m really into post metal which combines of my two favourite things – post rock and metal! Bands such as Isis, Pelican, Cult of Luna, Russian Circles, Red Sparowes, Sleepmakeswaves and local Perth band Tangled Thoughts of Leaving are on high rotation. My current CD collection stands at about 600 CDs, it has been trimmed down, I’ve probably had about 700+ in my lifetime but I’ve sold the CDs which I have outgrown or no longer listen to. Let’s celebrate music and record buying! A beautiful and touching video that I saw last week on the power of music. Mark this date in your diary – 21 April 2012 = Record Store Day. A lot of Perth record stores are having special discounts, giveaways and events for Record Store Day so make sure you check them out!